Do you ever find yourself visiting a big box store and then prefer ending up in a local small shop offering similar products or services? I do all the time. Why is this? Shop local isn't just a phase it's an important part of economic growth. The difference is a local business needs to be more efficient to survive. Not having the big resources a big box store has will make it more important to be effective with local business advertising. Whether you're a small cafe serving up delicious treats and caffeine or a clothing store trying to create an experience a big box store can't provide, you're still trying to grow a business in a small market. Because of this, you'll need to be creative with the marketing campaigns you create to get the most value out of your potential customers. Here are three ways to help market your local business. It's important to realize you can't service everyone as a small local business, so knowing your audience can help you learn your audience so you don't waste money and effort on marketing to other audiences. An easy way to do this is through location targeting with Google Ads. When creating a pay-per-click campaign you can use one of the most effective forms of targeting called, radius targeting. Here is what radius targeting looks like when creating ads. Every business has a different optimal radius so you need to keep in mind how far someone is willing to travel for your product or services. Someone running a cafe might not want to target people who has a 45 minute drive despite how delicious that cup of joe is. On the other hand if you are running a wedding dress shop you might find yourself targeting people well over 45 minutes away because the competition isn't nearly as large. Knowing your audience demographic becomes a huge part of knowing your audience. How your audience finds their information is key information to creating an effective campaign. This might be useful for every type of business like a coffee shop but if you are that wedding dress store owner, knowing who is searching and how they are searching for your products is key to your success. Driving school owners should target parents of kids in their teens. A dog kennel owner should target those who are pet owners. See what I mean? Understanding where you fit in the local market will help you find an understanding of your target audience. Mobile search and desktop search is treated differently despite the large increase in mobile users over the last few years. People search differently depending on the device they are using. People almost always use mobile when searching for local businesses. If you are out and about looking for something specific you generally go to your phone, plunk in a search term and add "near me" to the end of that phrase. If you are a business that survives by local, putting an emphasis on your pay-per-click bids to automatically increase when the term "near me" is included. This will give you the upper hand in beating the competition. "But.. I am local, how can I make myself more local than that?" There are a few ways to do this. When you are working with Google Ads, make sure you segment your campaigns by location. Here is an example, if you are local to Saint John, then create campaigns for Saint John, Grand Bay, Rothesay, Quispamsis & Hampton. These are all very close locations but if you have campaigns for each location then you can inject dynamic keywords based by location. 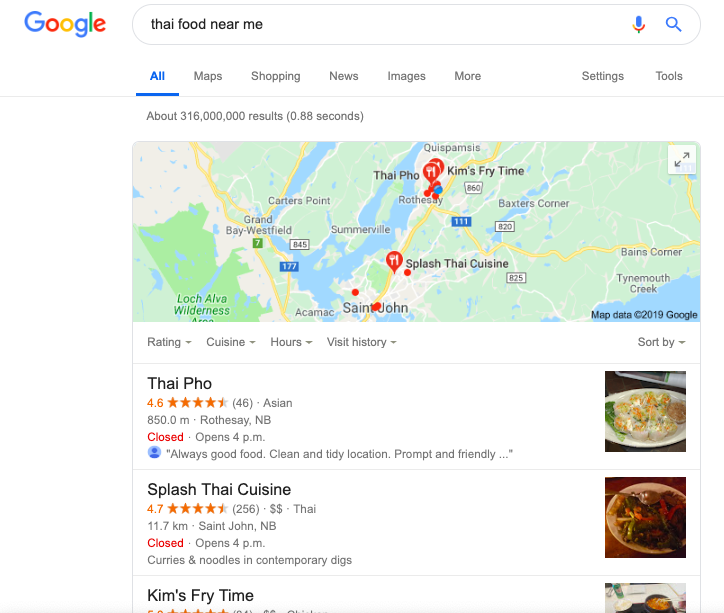 Example: Saint John Thai food and Rothesay Thai Food would be an example of location keyword insertion. 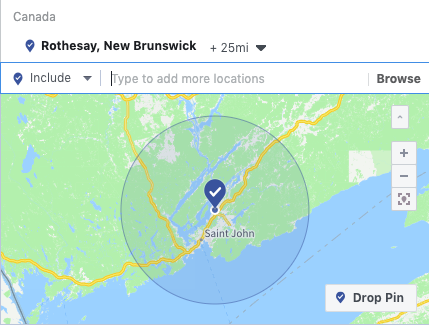 You could have searched "Thai Food" while in Saint John but the ad comes up "Saint John Thai Food" because your phone knows you are in Saint John. Take it one step further and have landing pages segmented by location. The more your messaging aligns with search ads then better the ads are going to preform. If your business is made for walk-in traffic you will want to ensure you enable location extensions within your Google Ads. This is a free add-on that automatically links your physical address on mobile. This allows a consumer to click on the link to your location and have directions directly appear on your screen within Google maps. Instant GPS? Thank you Google! Consumers are looking to finding their answers through Google more and more. Doing their own research by reading up on customer reviews and photos is more and more important to your strategy. Depending on where you live, there are either hundreds or thousands of businesses out there potentially offering similar services and products as you. Because of this, local business advertising is necessary to ensure business growth. Optimizing your Google Ads to have a local search aspect is a must in 2019.